The Core for Clinical Research Data Acquisition (CCDA) is one of the 10 Data Trust analytic teams responsible for assisting researchers with accessing clinical data for research. Additionally, we are one of the clinical research informatics cores under the Institute for Clinical and Translational Research. Natural Language Processing service–Text mining and information extraction methods to identify disease, medications, symptoms, and signs from clinical text, as well as artificial intelligence techniques for sentiment analysis, opinion mining, measuring cognitive ability, and exploring social determinants of health. We have built an infrastructure that enables data through a secure, repeatable process that meets your needs, the institution’s values, and applicable privacy and security laws and policies. We looked at how comparable research institutions met this demand, and determined to pursue this approach. 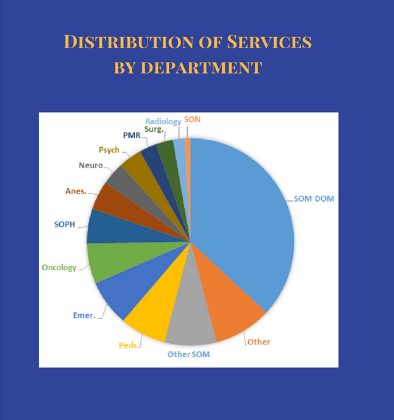 Similar to the 20+ other service centers at JHU such as the Genetic Core, the Biological Repository, and the Training and Management Development programs, we have developed a no-profit, revenue neutral approach that aims to provide high quality, lowest possible cost service to the research community. This hourly cost includes analysts, database administrators, servers, software, and management. Our customers can include researchers’ IRB-approved research studies, including, but not limited to researchers from the School of Medicine, School of Public Health, and the School of Nursing. What Data Sources Are Available? Our team is comprised of trained data analysts with access to multiple data sources including Epic, CaseMix/Data Mart, EPR2020 (Electronic Patient Record), Clinical Research Management System (CRMS), and Sunrise Clinical Manager (POE). What Data Do We Provide? What Data Is Available in Epic? Data availability in Epic depends on many factors, including clinic/location, specific data elements, and Epic go live at each location. See the graphic below for a timeline of available data. To get started you can submit a request to our team using the iLab portal (https://johnshopkins.corefacilities.org/service_center/3796?tab=requests). Please click the login button on the top-right of the window; then, select “JHU user”. The CCDA manager will contact you within two business days to schedule a brief intake meeting to discuss your specific requirements. 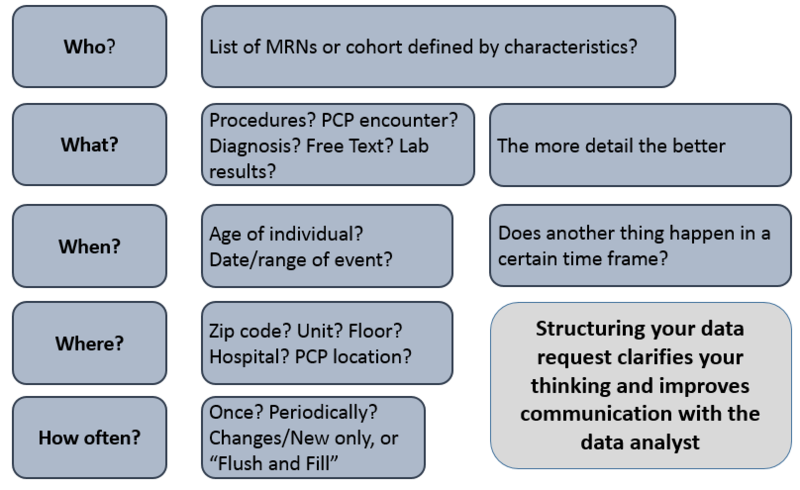 What Information Is Considered When Structuring a Request? In order to prepare for your initial intake meeting, it is often helpful to consider the following components regarding the specific data elements of interest: who, what, when, where, and how often. Please see the graphic below for more information about how to turn your high concept into an actionable request! How Can the CCDA Assist Me in Ensuring Compliance with IRB and Data Trust Best Practices? As part of our Honest Broker responsibilities, the CCDA will only deliver data extracts to secure locations approved by the IRB and Data Trust. We recommend requesting a SAFE Virtual Desktop when specifying the location for PHI storage and analysis. The SAFE is a Windows 10 desktop installed with statistical software including R Studio, SAS, Stata, MS Office productivity suite (Excel, Word, Access), and Python. By using this virtual desktop, you can ensure that the data we provide will be secure. For more information on data trust and the SAFE Desktop, please refer to the following other informational pages. As you can see in the graph below, a majority of the projects that the CCDA handles are small-medium sized, with a majority of time being spent on medium-large projects. The CCDA is happy to work with you no matter how complex your project is.